Picture a desert island with rolling dunes and gentle waves which you have lived on for years and made your home, now picture that those who banished you here and who have taken everything you owned, land on your i sland. Welcome to the Shakespeare Theatre Company’s The Tempest. Geraint Wyn Davies as Prospero. Photo by Scott Suchman. The plot of The Tempest is very straightforward. There is a usurped duke who is also a magician and his daughter who witness a shipwreck, which results in a romance and a plot for murder. However, the truly interesting parts of the play are the characters. The main character is Prospero, played by Geraint Wyn Davies who potrays the gentle and loving father to Miranda, played by Rachel Mewbron, who accurately shares with us the hilarious innocence of a girl who has lived on a deserted island with just her father for company. In addition, Davies also shows the darker side of Prospero as a magician trying to get revenge on his betrayers equally as well as the father archetype. 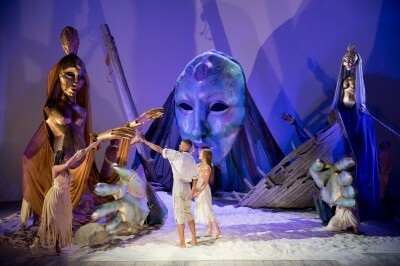 Because of this balance of two personalities, Prospero’s character development is extremely evident towards the end when he lets his spirit, Ariel, played by Sofia Jean Gomez, free and shows sympathy towards his servant, Caliban, portrayed by Clifton Duncan, whereas before he controlled them. He only considered his personal needs and wants, especially revenge on his enemies, but by the end he decided to abandon his magical powers. The show’s set was also remarkable. While sparse, the stage only populated by half a ship and a sad tree, it allowed the actors space to move and transported the theater into Prospero’s magical island. This impression was furthered by the masterful stagecraft of director Ethan McSweeney. 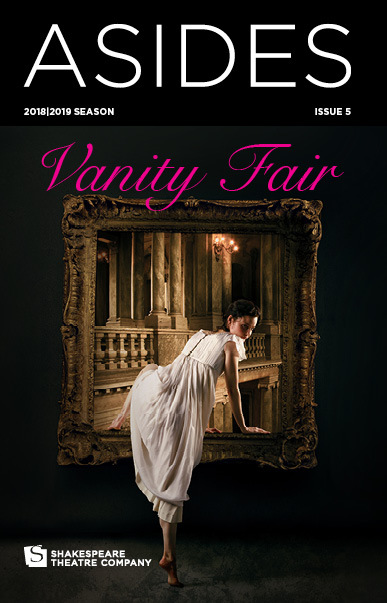 Although many of the shows visual images were ostentatious, it mostly flew clear of the ever-present danger of doing too much for not enough of a reason. The flying of Ariel, Propsero’s magical servant and love interest played by Sofia Jean Gomez, illustrated this perfectly. Although flying is too often used as a gimmick, this play used it to deepen the relationship between Prospero and Ariel, as it allowed Propsero to appear to control Ariel’s every movement. Avery Glymph, Rachel Mewbron and the Ensemble. Photo by Scott Suchman. Perhaps the most eye-catching part of this production is the colorful and graceful puppets physicalizing the goddesses and sprites called upon by Prospero’s magic. James Ortiz guides many puppeteers to create ethereal movements underneath the beautiful tones of Nancy Anderson’s soaring voice. It is these moments of magnificence that carry the production along. While the tech is what should bring you in the first place, many strong performances abound to keep you riveted. 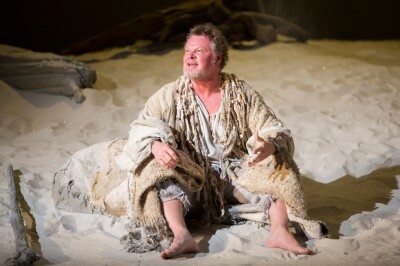 Geraint Wyn Davies as Prospero holds the show together with gravitas and passion. His fatherly persona expresses itself in his interactions with Sofia Jean Gomez’s Ariel and Rachel Mewbron’s delightfully childish Miranda. Besides a stunning display of scenography, the performance features outstanding actors who excelled in playing their designated parts. The performances of Prospero, Caliban and Ariel were by far the best throughout the performance and were consistently intriguing characters. Ariel’s performance was flawless, Sofia Jean Gomez, seemed to embody the part. Her behavior’s as Ariel mirrored Puck from A Midsummer Night’s Dream which provided a realistic portrayal of the story The performances of Prospero, Geraint Wyn Davies, and Caliban, Clifton Duncan, were also fantastic. Like Ariel, both actors seemed to embody the roles they were playing which made the show seem like a reality. 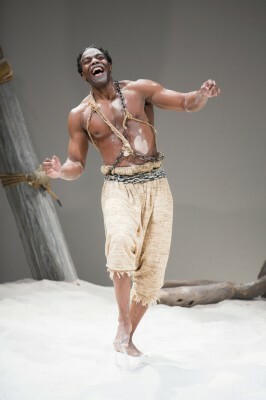 Clifton Duncan as Caliban. Photo by Scott Suchman. Caliban (Clifton Duncan), Prospero’s servant whom Prospero calls a monster, was fantastic. He moved in a very distinctive way that portrayed Caliban as a creature yet still conveyed a human quality that made him sympathetic. Caliban seemed to be the only one that truly understood the island, knowing where everything was fertile when no one else did. Prospero also showed strong acting and the comic trio of Trinculo (Liam Craig), Stephano (Dave Quay), and Caliban was very entertaining. The lighting of the production, designed by Christopher Akerlind, also set the mood for many scenes. When the ships clown, Trinculo, and its butler, Stephano, first enter the story, the lighting is bright and lively; perfect for their comedic scenes. In scenes between the two lovers, Ferdinand and Miranda, the lighting is dim and delicate; perfect for romantics. Props lastly must also be delivered to the ensemble members, whose performances as Ariel’s attendants/other mystical beings of the island create inventive and visually appealing stage pictures. Sofia Jean Gomez as Ariel. Photo by Scott Suchman. There are many unique sequences in the play that deserve note, as well. Ariel’s roped “flying” effects, directed by Stu Cox, are a fantastic novelty, and elevate (the unintended puns continue) this production to another level. The utilizing of a thick rope for this ties (argh!) in well to the play’s emphasis on Ariel’s bound (…) role as Prospero’s servant. James Ortiz designs an impressive set of enormous masks and puppets for one sequence, that while a little strange, are visually compelling. Lastly, unique lighting concepts are used frequently to great effect to create beautiful ambiences and moods in this play of so many emotions.